Joyful Socks Mom: Top 10 Reasons We LOVE to Spell Again! Spelling has long been an area of much needed improvement for us as a home educating family. Our lack of zeal for the subject is rivaled only by the dreaded "four letter M word". I am not a natural speller to say the least, and rely heavily on the miracle of spell-check in all my writing ventures! This is why I was excited to partner with our sponsors for upcoming MOM ONLY! Boot Camp, All About Learning to review one of their curriculum packages, ALL ABOUT SPELLING Level 1 & Level 2 with Deluxe Interactive Kit. 2. Organization Rules! I love that ALL ABOUT SPELLING comes with all its elements ready, easy to assemble, and in an easy to organize manner. The kids love having their own spelling review box and I love less mess . . . Who doesn't? 3. Support, Support, Support! We home educators cannot seem to get enough of that . . . but with ALL ABOUT SPELLING the customer support is friendly and ready to help you find what works for you and your family. I spent 1 1/2 hours on the phone with Greg who was friendly, informative and honest about what would work best for us. Let's be honest, good customer service is becoming harder to find! 4. Incremental lessons, using ALL ABOUT SPELLING, helps us to build on our last lesson, adding knowledge each day to what the kids have already retained. This has definitely added to the confidence level in our spelling abilities. I have enjoyed the improvement in the Bug's attitude in her spelling instruction as well. Whew, thanks! 5. The hands-on lessons that ALL ABOUT SPELLING provides help break the tedium of spelling in general. (Yes, those of us that are not "natural spellers" do, in fact, find the subject tedious at times!) The tiles used to practice spelling words help to make this time more engaging for any learner. 6. I love the spelling lessons that ALL ABOUT SPELLING clearly provides for me, as the instructor. The lessons are well scripted, leaving me with less preparation time before lessons. 7. The spelling instruction, provided by ALL ABOUT SPELLING, uses one-on-one lessons with my children, allowing me to individualize the lesson to their needs and go at their own pace. 8. We now have the means to decode all those spelling rules that keep us confused, without proper explanation. ALL ABOUT SPELLING provides direct spelling instruction that helps to better understand and remember all those "elusive" spelling rules. 9. Reasonable pricing for a valuable curriculum. ALL ABOUT SPELLING curriculum can be purchased with the Deluxe Kit to begin, then adding your additional student packs and teachers manuals for each level completed. This means less from the pocket each year . . . that's fine by me. 10. We can stick with this spelling curriculum. 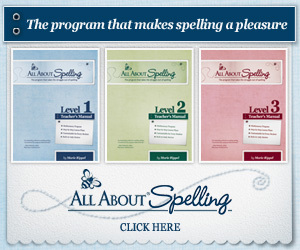 ALL ABOUT SPELLING has a complete curriculum for each grade, no waiting for next volume . . . Yes! I could find no down side to using ALL ABOUT SPELLING. Everything from the cost to the lessons made this curriculum a wise investment in both funds and time. To have a smiling face on a child who used to deplore spelling is worth all that was invested, and ALL ABOUT SPELLING made it simple. That is why we love to spell again! MOM ONLY! Boot Camp - Having a Generational Heart in your homeschool. COME join us for a chance to win an ALL ABOUT READING Kit from All About Learning Press - - - REGISTER TODAY! ONLY 50 Seats Left!!! We love All about Spelling, although I had been a bit lax on it this past year. We are going to ramp it up this coming year though. And I'm still considering the All about Reading program, I hear it's wonderful. All About Spelling is great for keeping your own pace! I love that about homeschooling in general. Wonderful! We start this program in a few weeks. I am glad to hear such a nice review of it.